Now you can keep your Nintendo DS powered and protected wherever you go with the Universal Starter Kit for Nintendo 3DS/DS. This kit includes everything you need for protection and power. 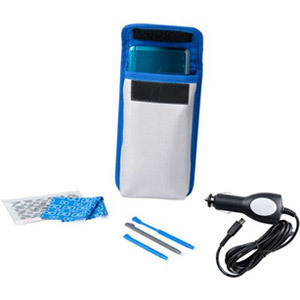 It includes a convenient carrying case to protect the system, a car adapter for power while on the road, 3 styluses for the touchscreen, a cleaning cloth to wipe away messy fingerprints, and lower-screen protectors to help protect against scratches. The kit is designed for use with the Nintendo 3DS/3DS XL and the DS/DS XL.